I ENJOY WINDOW-SHOPPING. But when I window-shop, I’m not typically perusing merchandise to purchase. Rather, I’m shopping for signs to photograph. It’s cheaper that way; you don’t spend money except on your gas to reach whatever destination you choose. For me, that is Main Street in Smalltown, Minnesota. Signage regulations are less strict in these rural communities, folks more trusting. I discover the most intriguing/interesting/unusual/creative signs here. Pick your adjective—all three would apply. So let me take you today to Janesville, population 2,100, located along U.S. Highway 14 only 15 miles east of Mankato. I stopped there several weeks ago on my way to and from (yes, we stopped twice) Indian Island Winery with my husband. 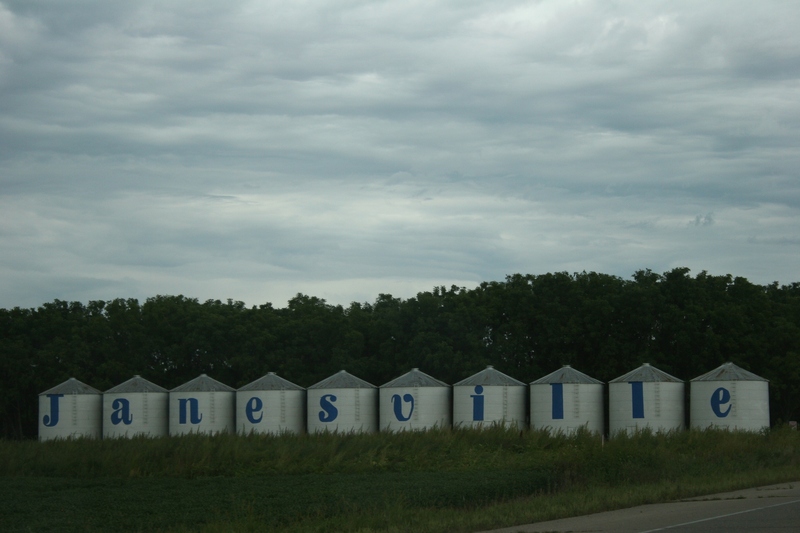 Entering Janesville from the west along old Highway 14, you'll see this grain bin signage welcoming you to town. I've always wondered: Did the farmer specifically build 10 bins to fit the town name? Or did someone come up to him after the fact and say, "You know, J-A-N-E-S-V-I-L-L-E would fit on your bins." But before I show you my discoveries, here are two interesting tidbits about Janesville: The town has a nine-hole reversible golf course, one of among only a few in the U.S. If you know what that means, you know more than me. I am not a golfer. Secondly, in a house near downtown Janesville, along old Highway 14, you’ll see a dummy peering through an upstairs attic window. It’s been there for years. Why? No one seems to know the truth. But its placement there has led to all sorts of speculation as imaginative as an imagination allows. 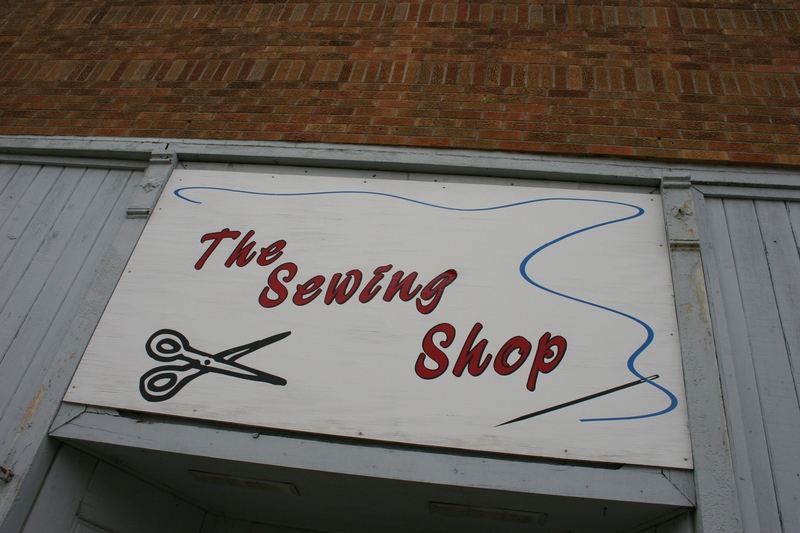 Now, moving along, I’m pleased to present photos of signage from Main Street, Janesville, Minnesota, for your entertainment. Enjoy. 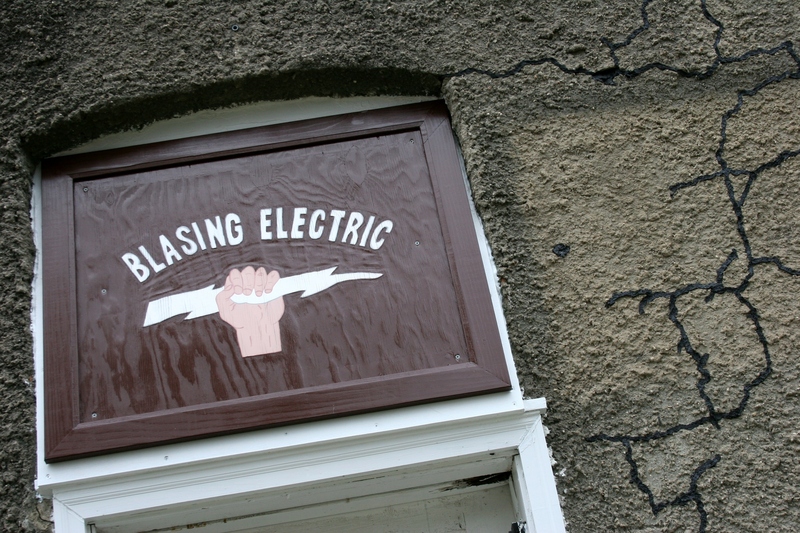 This handcrafted graphic sure makes for a memorable Blasing Electric sign hung on the side of a building across the street from the library. I know you folks in bigger towns, especially in the Twin Cities metro, take your television access for granted. But not so in rural Minnesota. 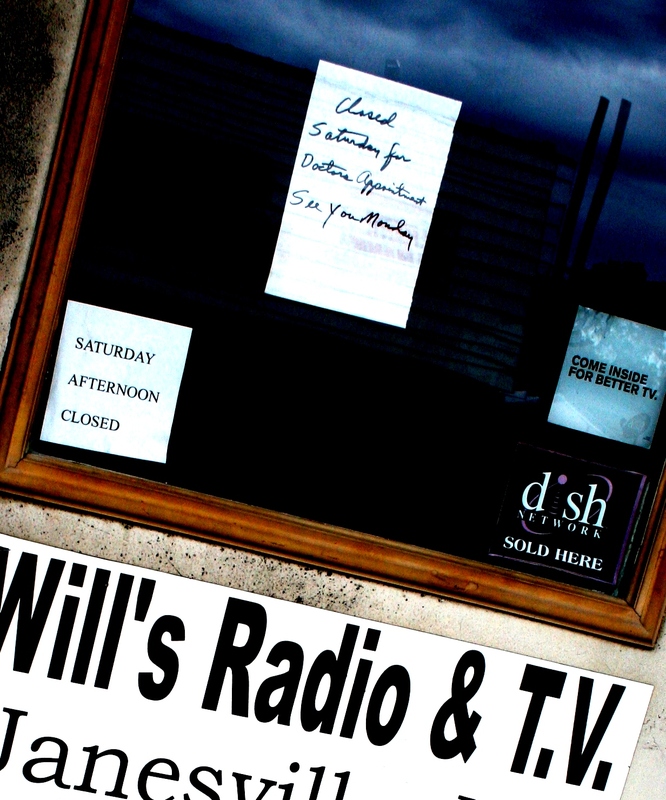 Here's a pitch for better service posted on a window at Will's Radio & TV. 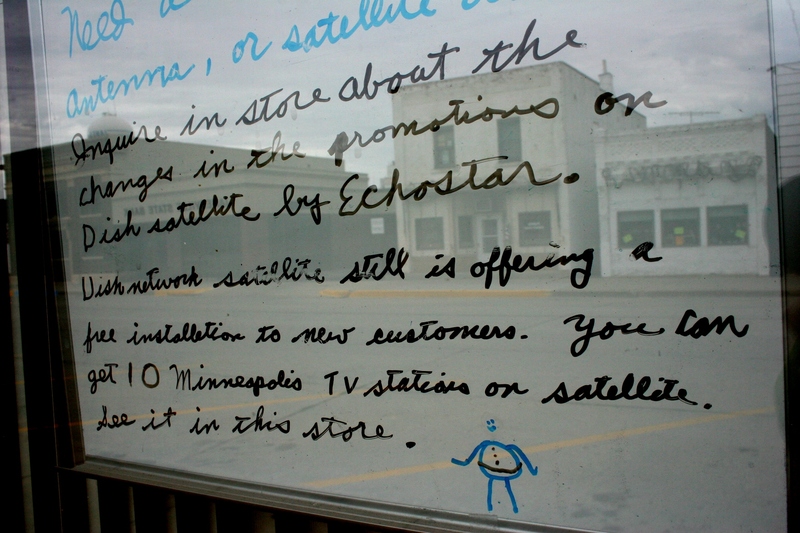 But you might not want to stop and check on that satellite service until Monday, according to this sign posted on Will's front door. Will is at a doctor's appointment. Hot weather also offers a good excuse to close up shop. 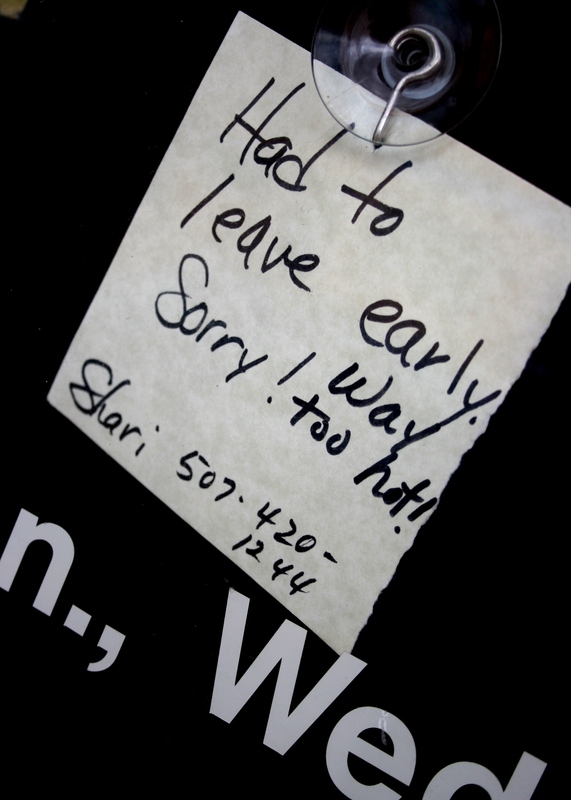 I can't recall where this note was placed, but either on a beauty or sewing shop door. Homemade signs like this one are always a bonus find on small-town Main Street. Jethro's Soda Shop, which is no longer open, sports a misspelled word. Can you spot it? Finally, my last photo, which is not a sign, but merchandise in a window of the corner drugstore. 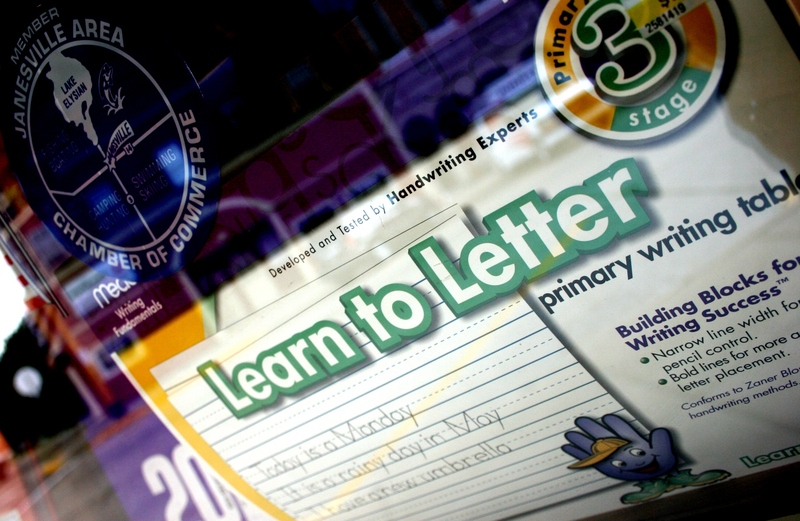 The ruled tablet brought back grade school memories for me. Gotta love it. Main Street in Smalltown, Minnesota. 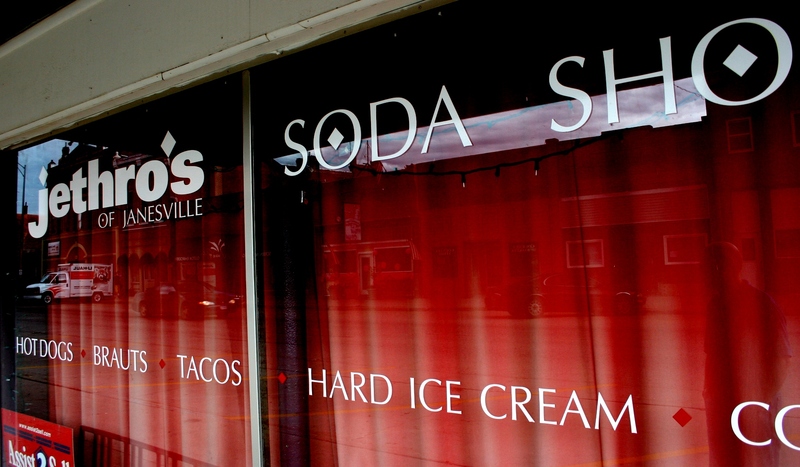 DID YOU FIND the incorrectly spelled word on the window of the former Jethro’s Malt Shop? That would be “BRAUT.” My husband contends that is the German spelling of “brat.” I contend he is wrong as my research shows that “die braut” in German translates to “bride” in English. Thank you for stopping by Minnesota Prairie Roots. It’s always nice to connect with other bloggers who have a passion for photography. I checked out your photos and liked what I saw on your blog. There aren’t many secrets in small towns, that’s for sure. My most interesting small-town window sign (thus far) was the funeral notice posted in the Gambles Hardware store window in New Richland, Minnesota. My husband and I found that on one of our Sunday afternoon drives this summer. Have you read my July 24 “Canning jars and funeral info at the hardware store” post? If not, check it out. Confusion for the customer probably closed Jethro’s. Imagine ordering a “brat” and you got a “braut” or vice-versa. And what condiments come with that “braut”? Once again your humor shines. You could possibly be correct on that confusion issue. Thanks for commenting. I’ve missed your interesting insights. As for your reversible 9 hole golf course….you can play 9 holes one way and then play them backwards to get your 18 holes in for the day…I think. I am not a golfer either, but my husband is, I simply chose not to ask! That’s what I figured, but thanks for the clarification. I took golf in college. It was a pass/fail class. I nearly failed. That’s the kind of golfer I am. I have not touched a golf club since.